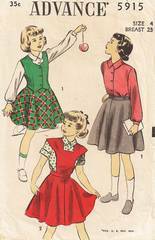 Vintage Advance 5915 sewing pattern. Flared skirt has optional attached bib that criss crosses in the back and buttons to waistband. Front buttoned blouse with short sleeves or long sleeves gathered to buttoned cuffs. Skirt may button to blouse at waistband. Weskit has three button front closure. Girls Size 4; Chest 23; Waist 21. Pattern is used and complete. Unprinted pattern pieces, precut to size and perforated for identification. Envelope and contents are in average vintage condition with appropriate aging.